Printing at CSE is now done via the UNSW Managed Print Service provided by UNSW IT. 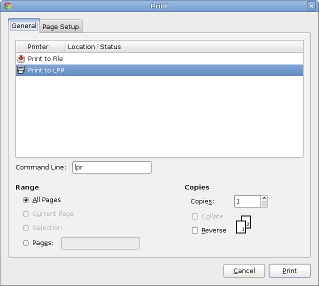 When you are using a CSE lab computer, you can simply print to the default print queue (named stu), and release the job at any student printer on campus. If the application you are using has a 'command line' field, just set it to lpr. To print from the terminal, just use lpr filetoprint.txt. Note that PDFs may not print correctly from the command line - use acroread or xpdf to open the file, and print directly from the application. Although you can send jobs to these queues from CSE, there are no printers in the school that can release those jobs. You will need to use printers at other locations on campus (such as the library) to actually print them. For a list of locations, see the Campus Printing page at UNSW IT. Once you have sent your print job to the print queue, you can go to any MPS printer to print it. Present card to RF reader as directed. Enter your 4-digit Print Service PIN. Select print jobs to print. For more details, see the Campus Printing page at UNSW IT. The first time you use the UNSW Print Service, you will need to set a Print Service PIN. If you have forgotten your PIN, reset it at the Print Service Portal. Undergraduate and other course-work students do not start with any printing credit. Buy print credit with the UNSW Print Service. Recharge options are located across campus.